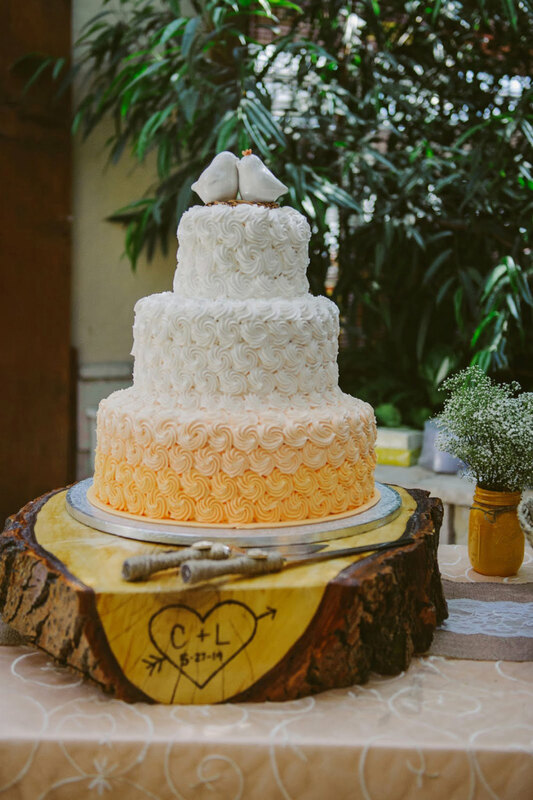 If you’re looking for a bird cake topper for your wedding, you’re in luck! We found the cutest topper collection featuring sweet nuzzling love birds! 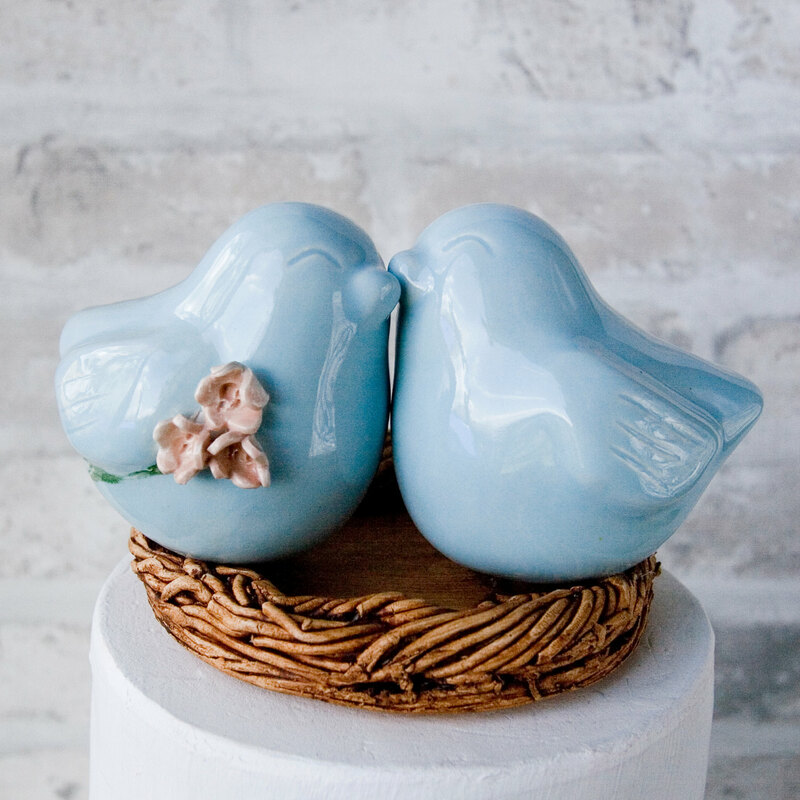 These cake toppers by Dances With Clay are fit for a bird themed wedding or, to be honest, any theme of your choosing. These toppers are always a crowd-pleaser and they’re consistently the most-loved among these picks. 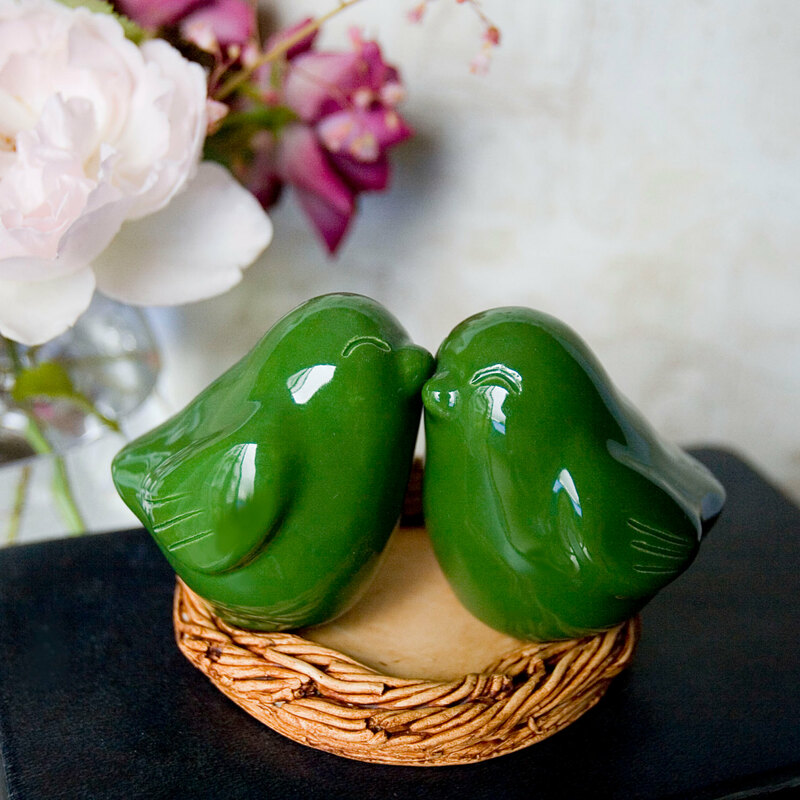 Each pair of birds is handmade and engraved on the bottom for your big day. Take a look — this topper is our handmade-a-day pick. Enjoy! This something blue bird topper is available in any color, but isn’t this such a pretty shade of blue? 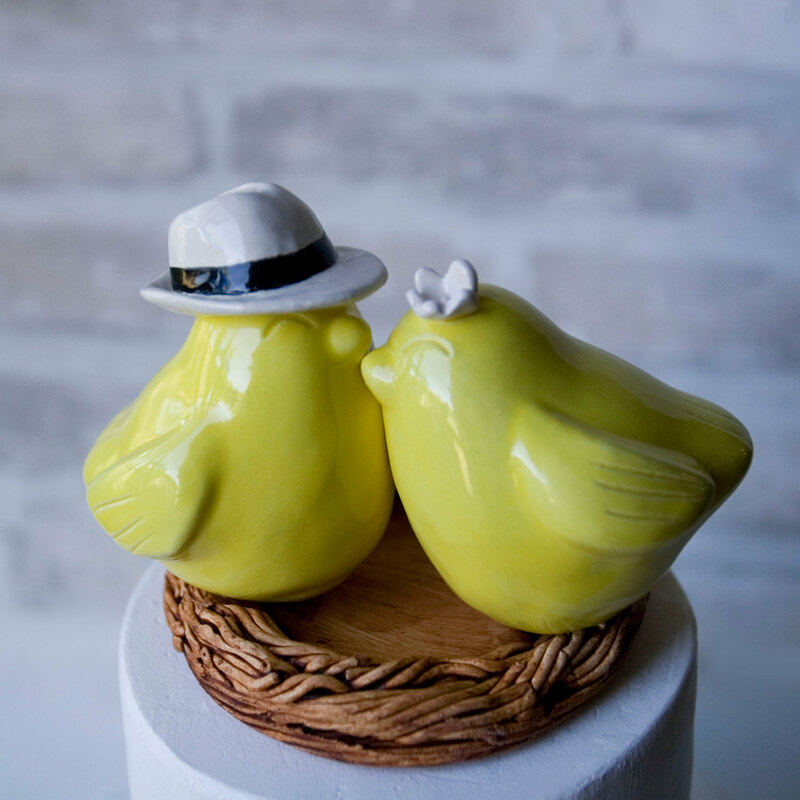 These birds are perched on their nest; the birds are handcrafted with porcelain clay. 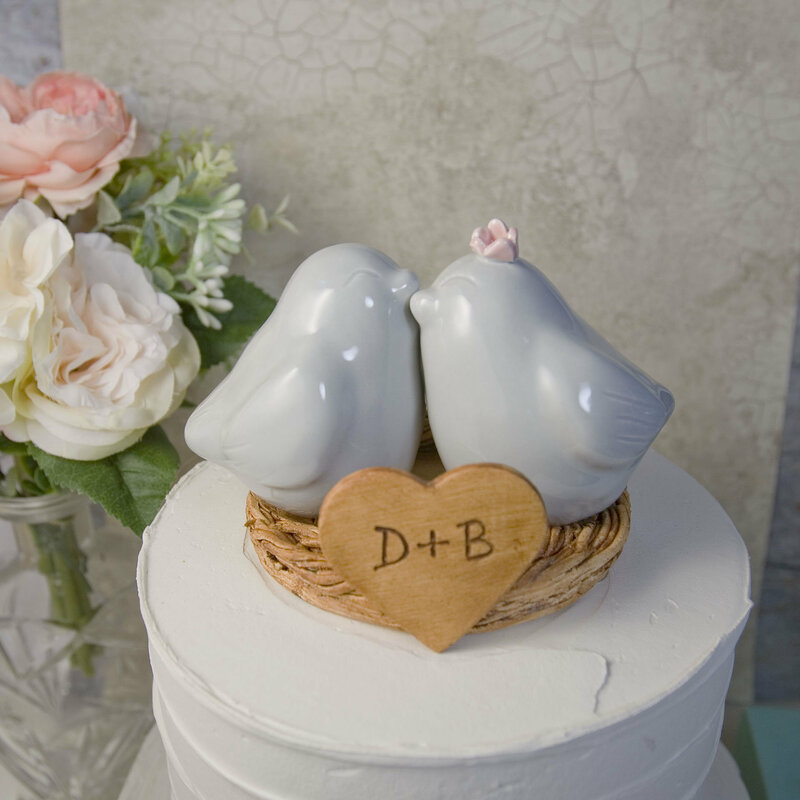 These charming love birds make a sweet topper and lasting heirloom from your wedding. The entire topper is handmade with clay, then glazed in a shiny celadon glaze. This particular topper features the girl bird with a bouquet of blush pink flowers under her wing; however, you can request a custom color for the bouquet to coordinate with your own. 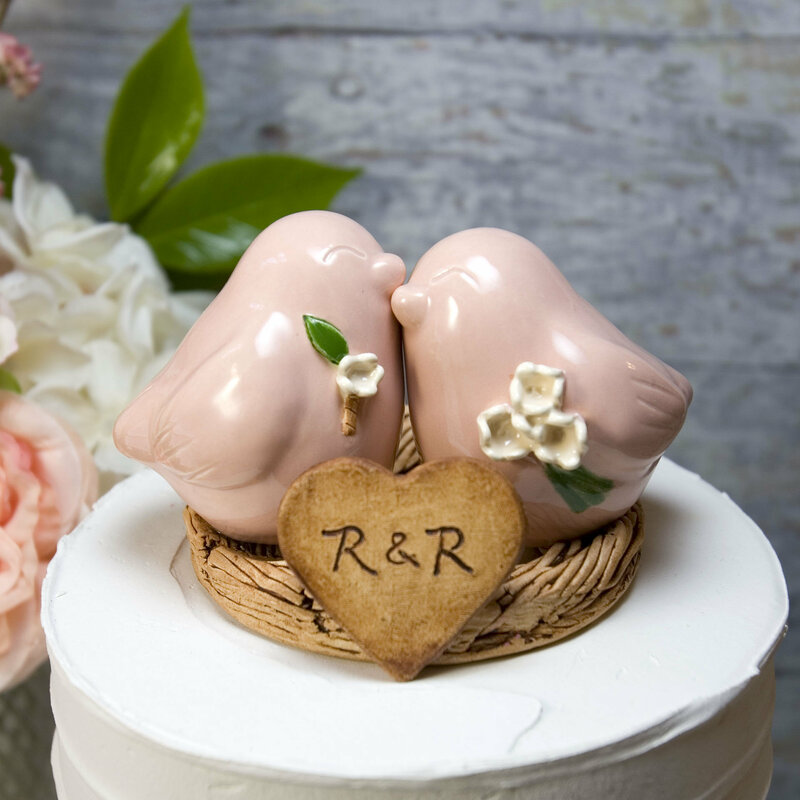 A love bird wedding cake topper is a popular choice for the reception because the nest, onto which the birds are perched, is symbolic. The nest is a symbol of nurturing and family, which is especially fitting for the beginning of your marriage. The nest is finished in a beautiful matte brown glaze as a perfect contrast. 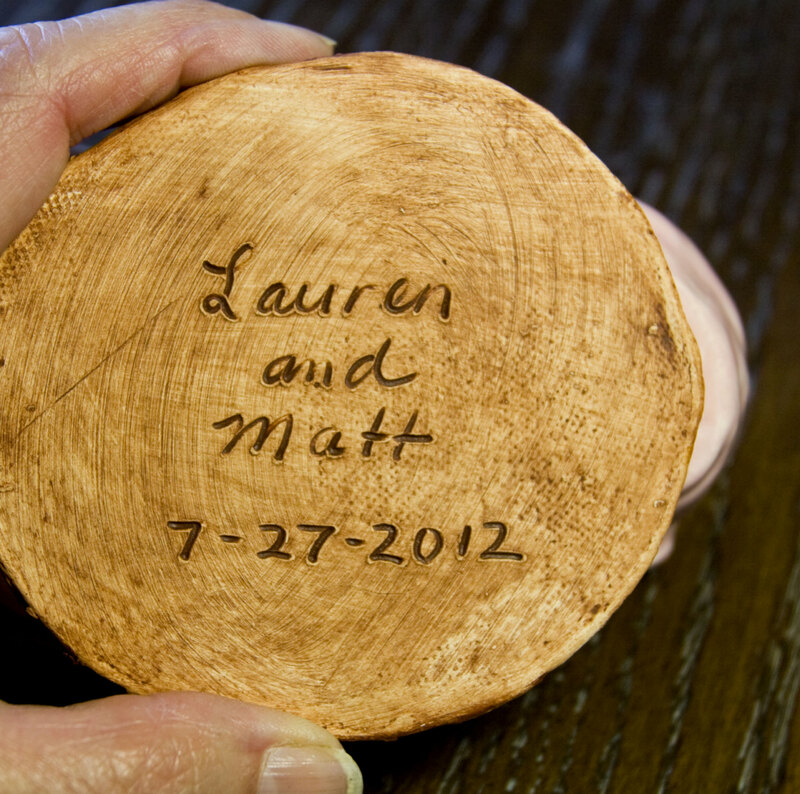 Your nest is custom-carved with your name and wedding date. 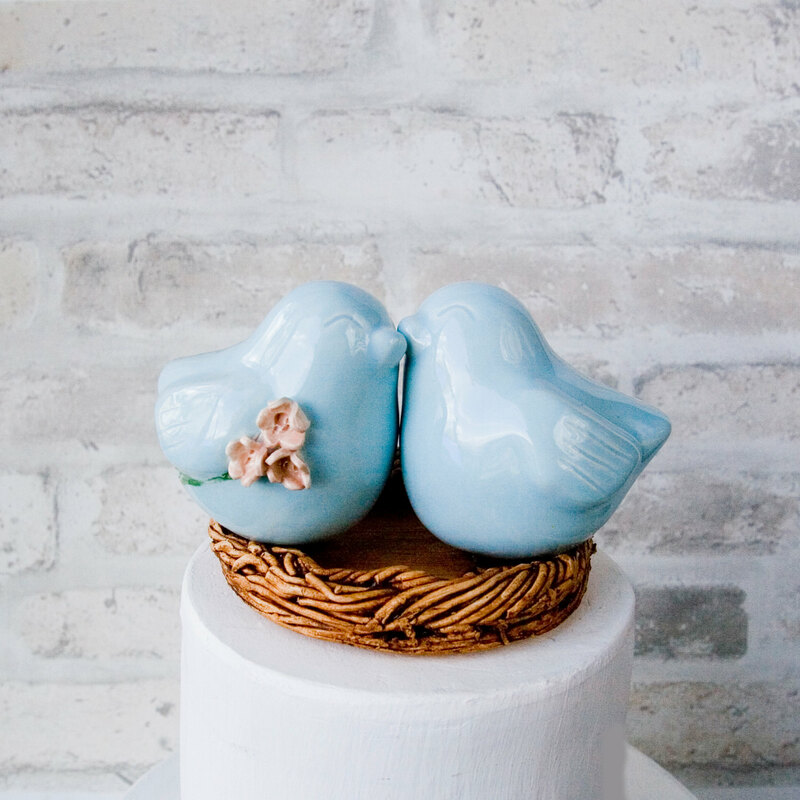 A bird cake topper such as this will add a special touch to your cake or cupcake tower. After the celebration, your topper will become a lasting reminder in your home decor of your special day. Your custom bird can have accessories, like a hat and a flower. Want a veil? A firefighter helmet? You got it! … or choose a soft grey hue with colorful flowers. 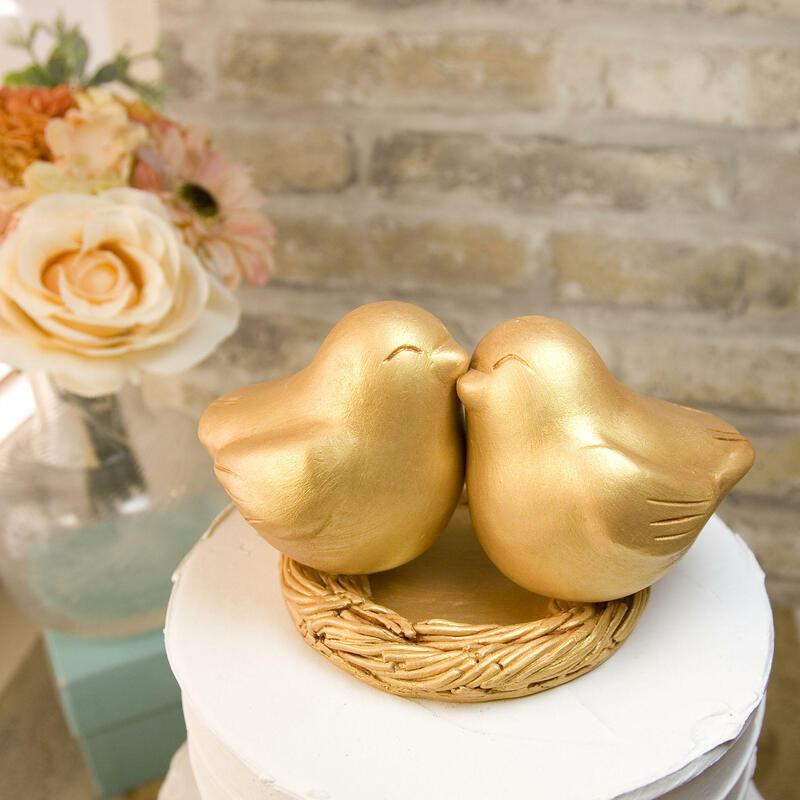 I love this bird cake topper dipped in gold! 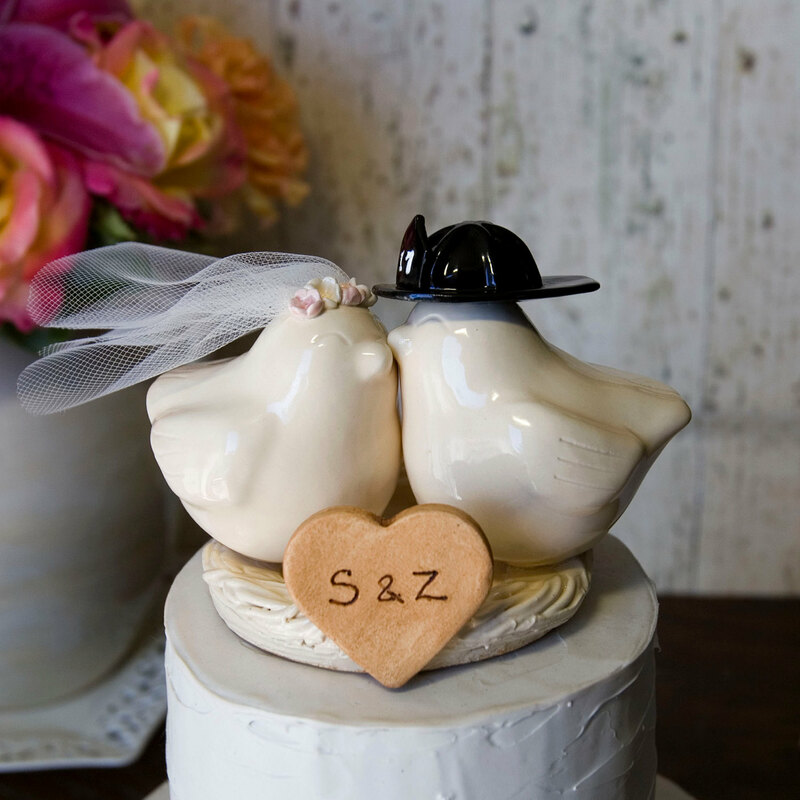 Here’s a bird themed cake topper from a real wedding. Gosh, I love this rosette cake style, too! Perfection. Want a bird cake topper of your very own? Kathy of Dances With Clay would love to make it for you. Most toppers are handmade, glazed, engraved, and shipped within 3 weeks. Shop here.